If you’re new to cigar smoking, there’s a chance you’ll want to try a cigar or two without investing in a humidor. You may have been given a cigar by a friend, colleague or relative that you plan to smoke at some point, but don’t want to smoke just yet. Although cigars have a reputation for being delicate and hard to store, it’s relatively easy to store cigars for short periods of time without a humidor. Below, we’ve listed four simple, affordable and effective ways to store your cigars without using a humidor. While none of these methods are ideal for long-term storage, they’ll keep your cigars fresh for a month or two while you look into acquiring a cigar humidor for your collection. If you only need to store a few cigars, you can use a large Tupperware container as a makeshift humidor. A 30+ cup Tupperware container is large enough to store two boxes of cigars, making it a great humidor alternative if you want to experiment with a cigar hobby on a low budget. Before you start, you’ll need to check that the Tupperware container is airtight. Close the lid and press down gently. If you can hear air escaping from the container, it isn’t completely airtight; if it doesn’t produce any noise, it probably has an airtight seal. Add your hygrometer to the Tupperware container. To make your Tupperware humidor easier to check without opening the lid, we recommend taping the hygrometer to the side of the container. Place your cigars inside the container, preferably inside their boxes. If you have a humidity pack or humidifier, place it inside the container. If not, you can use a moist sponge (make sure that it’s completely new and unused) as a source of moisture. Just like with a real humidor, you’ll need to open your Tupperware humidor every week or two to provide fresh air. We recommend using a Tupperware humidor for up to two months, after which you should transfer your cigars to a real humidor to prevent them from becoming overly moist. If you only have a small number of cigars to store, you can use a Ziploc bag to keep them at the right humidity level and prevent them from deteriorating. This method is best if you only need to store the cigars for a few weeks before smoking them. The Ziploc bag method is simple. Take a large Ziploc bag and store the cigars inside. Next, wet a small sponge (if you only have a large sponge, you can cut it down until it measures less than two by two inches) and ring out the moisture until it’s just slightly damp. Let the sponge sit for a minute or two so that any excess moisture drips out, then store it inside the bag. Seal the Ziploc bag and store it on a flat surface, making sure that the sponge doesn’t come into direct contact with the cigars. If you use this method to store your cigars for a week or longer, make sure to check the sponge occasionally. If it dried out, repeat the process to make sure your cigars have a good source of moisture. If you have a small beer cooler, you can use it to create a temporary humidor that will keep your cigars fresh for several months. Because a cooler has more space than a Tupperware container or Ziploc bag, this method is ideal for storing mid-sized collections of 25 or more cigars. The cooler method is very similar to the Tupperware method. 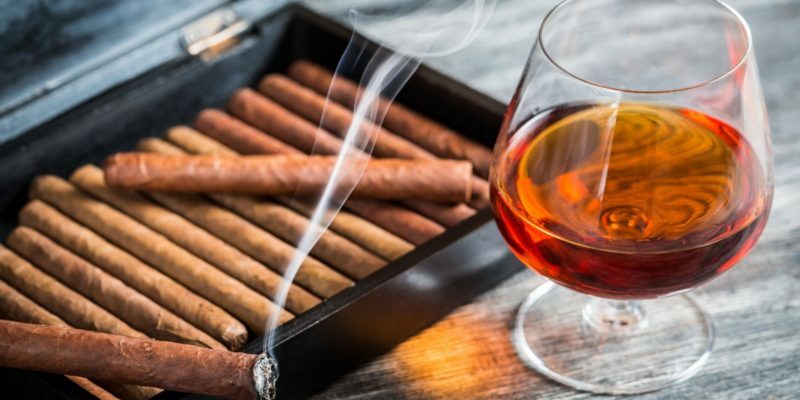 Place your cigars inside the cooler and install a hygrometer so that you can monitor the humidity level. Then, place a humidity pack inside the cooler to keep the cigars at a safe humidity level for storage. If you don’t have a humidity pack, you can use a moist sponge, just like you would for a Ziploc bag humidor. Because the cooler contains more air than a small bag, it’s worth using a full-size sponge instead of the one you’ve cut down to size. Like with a Tupperware humidor, you’ll need to open and aerate your cooler humidor every one to two weeks. This method will keep your cigars fresh for several months, making it a great way to get into cigar smoking without buying a humidor right from the beginning. Finally, if you only need to store your cigars for a week or two before you smoke them, there’s no need to use a makeshift humidor. Most cigars will stay fresh in their original wrapper for 2-4 weeks, giving you more than enough time to smoke a few without using a storage device.